4-piece, male lead vocals, 1x90 or 2x50 minute sets. Surf’s up! Grab your boards, baggies and bikinis! Europe's finest British Beach Boys tribute band are cruising into town. 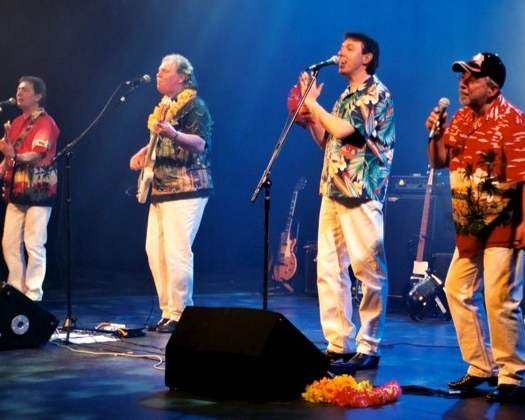 This Beach Boys tribute act perform all the greatest hits of the Beach Boys with harmonies that are both powerful and authentic, effortlessly conjuring nostalgic memories of those summer days. The band line-up is two lead guitars, bass guitar, drums and keyboards and every member additionally sings backing or lead vocals. Their dynamic performances and extensive Beach Boys repertoire, universally appeal to all age groups. The Beach Boys Tribute regularly perform to capacity audiences in theatres throughout Europe and the UK appearing alongside other bands from the same era including, The Tremeloes, The Swinging Blue Jeans; The Tornadoes; Dave Berry and the Cruisers; Freddie and the Dreamers; Dave, Dee, Dozy, Beaky, Mitch and Titch; The Yardbirds, The Merseybeats and many more household names. Individually the band members have played at many top venues including the Wembley Arena, appeared on radio and TV and toured with top stars including Meat Loaf and worked with many other notables from the world of music including Gary Moore (Thin Lizzy), Pick Withers (Dire Straits) and Denny Laine (Paul McCartney’s Wings). The Beach Boys Tribute have their own PA system and lights and normally play for around 100 minutes divided into two sets or a straight 90 minute set. For the 100 minute show for the first set they wear candy-striped shirts and in the second set Hawaiian shirts. In the 90 minute show you can choose one of the two themes.